A brownie and a cookie IN ONE. Yes, it’s possible! Dreams do come true. Let’s bake, friends! These quick-and-easy 10-ingredient cookies are adapted from our Best Almond Meal Chocolate Chip Cookies. 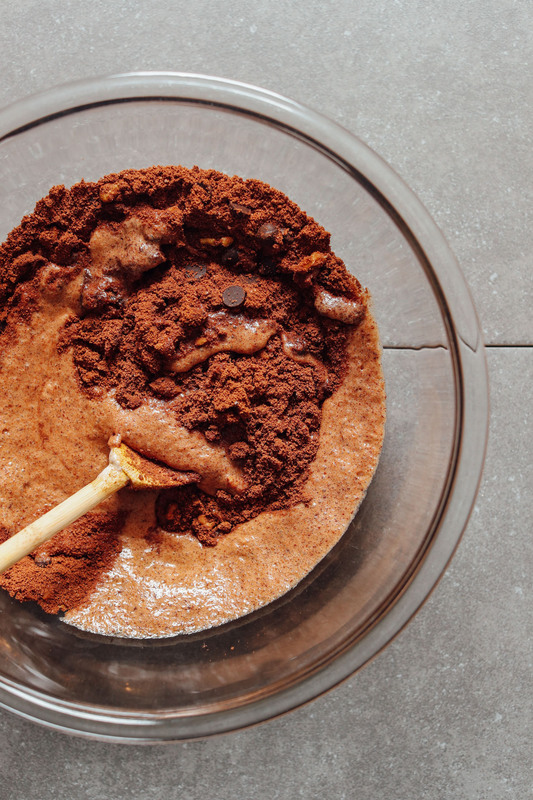 For dry ingredients, we went with cocoa powder, almond flour, coconut sugar, and sea salt. Walnuts and dark chocolate chips add the ultimate brownie factor, while chopped-up dates add more natural sweetness and a sticky, caramel-like surprise to bite into. Swoon! 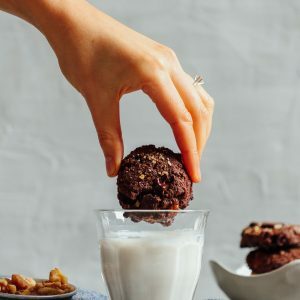 That means these cookies are not only vegan and gluten-free but also grain-free and naturally sweetened (if you use naturally-sweetened dark chocolate like Eating Evolved). We relied on aquafaba as the primary binding ingredient for the cookies as well as for added fluffiness. 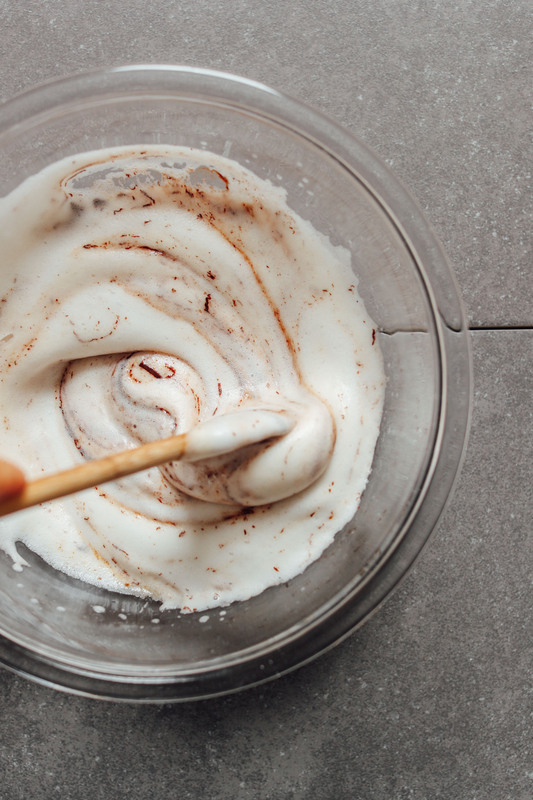 Whipped until soft peaks form, the aquafaba is then mixed with a little vanilla, coconut oil, maple syrup, and melted dark chocolate to constitute the wet ingredients. When mixed with the dry ingredients, it creates a tacky, semi-wet dough that tastes and smells just like brownies. After a quick chill in the refrigerator, simply bake for about 15 minutes or until fluffy and dry on the edges. 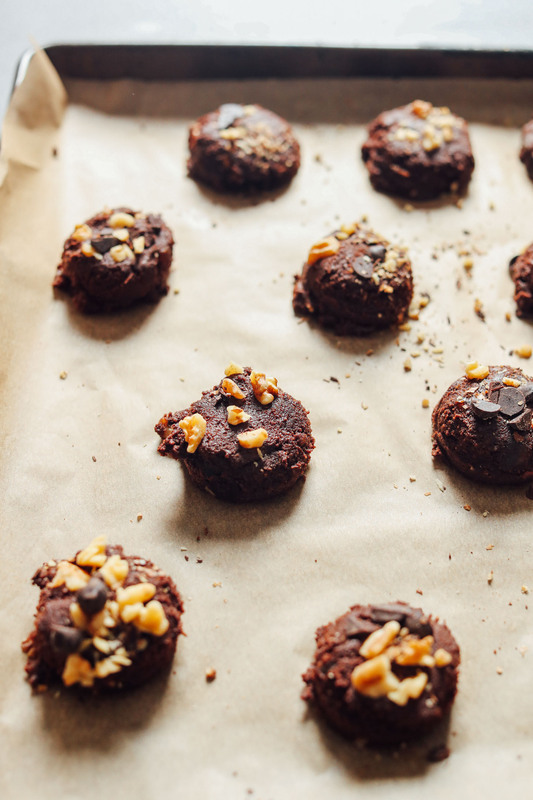 Wait a few minutes to cool (if you can) and then you’ll be diving into these indulgent (yes surprisingly healthy) brownie cookies! These would make a delicious dessert to have on hand throughout the week. And they would also be a fun treat to bring to group dinners or parties! We could also see them packaging up nicely to give as a gift. If you’re into brownies, also be sure to check out our Vegan GF Black Bean Brownies, Easy Vegan GF Brownies, Simple Vegan Brownies, and No-Bake Vegan Brownies with Chocolate Ganache! If you try this recipe, let us know! Leave a comment, rate it, and don’t forget to tag a photo #minimalistbaker on Instagram. Happy baking and cheers, friends! 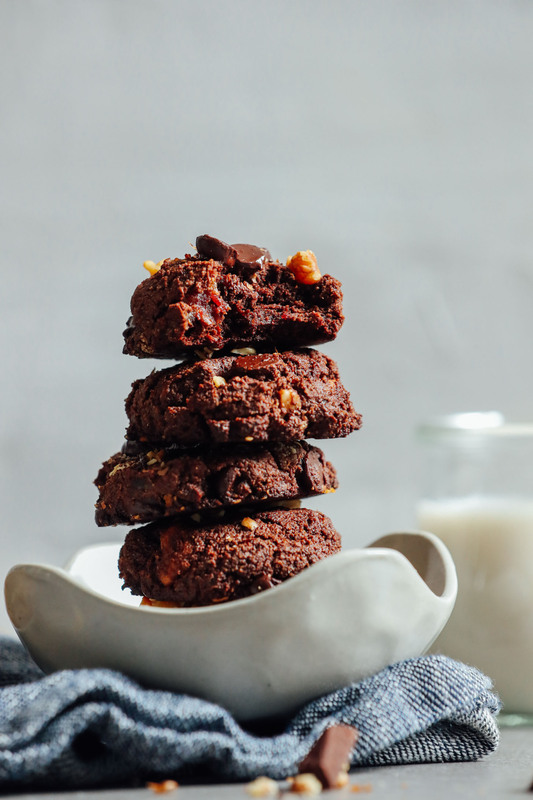 Insanely fudgy vegan brownie cookies that are tender on the inside, crisp on the outside, and reminiscent of a brownie! Just 10 ingredients required for these naturally sweetened gluten- and grain-free treats! 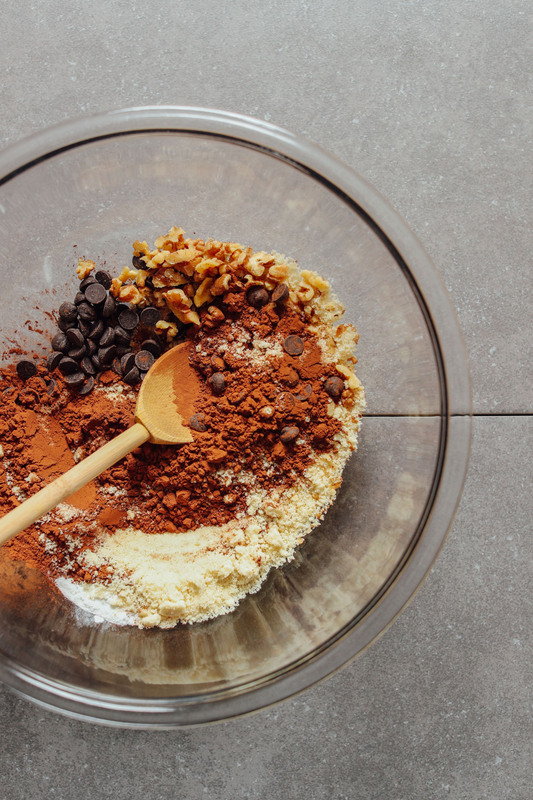 In a large mixing bowl, stir together almond flour, 1/4 cup (45 g) of the dark chocolate chips, walnuts (optional), cocoa powder, baking powder, sea salt, and coconut sugar. Add in chopped dates and use a whisk to combine / break up dates into the mixture. Set aside. To the aquafaba, add the melted coconut oil and vanilla and beat or whisk to combine. Then melt the remaining 1/4 cup (45 g) of the dark chocolate chips in the microwave or over a double boiler and add to the aquafaba. Fold/stir to combine (see photo). Add wet ingredients to dry ingredients and mix until well combined. You should have a semi-tacky dough. Loosely cover and chill in the refrigerator for 30 minutes. Preheat oven to 375 degrees F (190 C) and line a baking sheet with parchment paper. Scoop out roughly 1 1/2-Tablespoon amounts of dough (I likethis scoop) and place on baking sheet with about a 1-inch gap between each cookie to allow for spreading. Gently press down with palm of hand to form small discs (see photo). There should be about 12 cookies. Optional: Top with a few more chocolate chips and walnuts. Bake for 14-17 minutes or until puffy and the top no longer feels wet – they should appear mostly dry. Remove from oven and let cool 5-10 minutes. Then carefully loosen with a spatula and set on a wire rack or plate to cool. Enjoy immediately or let cool. Store completely cooled leftovers in a sealed container at room temperature up to 3 days, in the refrigerator for 4-5 days, or in the freezer for 1 month. These are insanely delicious as is or when warm and dipped in almond milk or hot chocolate! 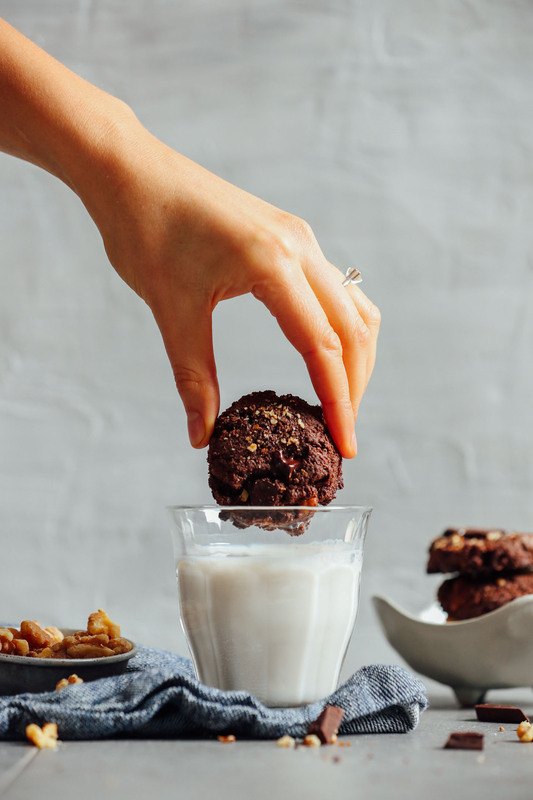 *After lots of testing, we prefer using Wellbee’s brand almond flour as opposed to Bob’s Red Mill, which can negatively affect the texture of baked goods. *Nutrition information is a rough estimate based on 1 cookie (of 12) calculated with the oil and without optional ingredients.